I'm looking for an assembly guide for my foil. Can you help me choose my ideal foil? Sure. Our "Help me choose" page will help guide you. Where can I find a list of all the foils and parts available? This pdf document summarizes our foil collection and lists the parts at a glance. Why aren't the wave foils available with Carbon masts? We made 65cm Carbon masts for the wave foils but canceled it at the last minute when our team riders ultimately and unanimously preferred the aluminium version. Our hyper-stiff aluminium mast with its proprietary extrusion profile gives a locked-in, solid feeling with more control and stability. Aluminium fuselages are stronger and stiffer, giving you more control. See our Technology section for more details. There's water in my mast. What should I do? Disassemble the foil and place the mast vertically so that the water can drain out one of the ends. Should I rinse and disassemble my foil? Rinsing and disassembling your foil helps to avoid corrosion and the bolts to seize and get stuck. Why isn't there a Powerbox option? We found the Powerbox, a common windsurfing fin fitting system, to fail easily. With a single bolt keeping the foil in place, it acts like a pivot point and bends when loaded vertically by a foil. The Powerbox was designed for lateral loads from a fin. My foil changes angle after take-off. It's a Deep Tuttle mounting system. How can I fix this? If your foil is changing angle when loaded, it's because the top of the foil head isn't touching the bottom of your Deep Tuttle or Foil Box in the board. 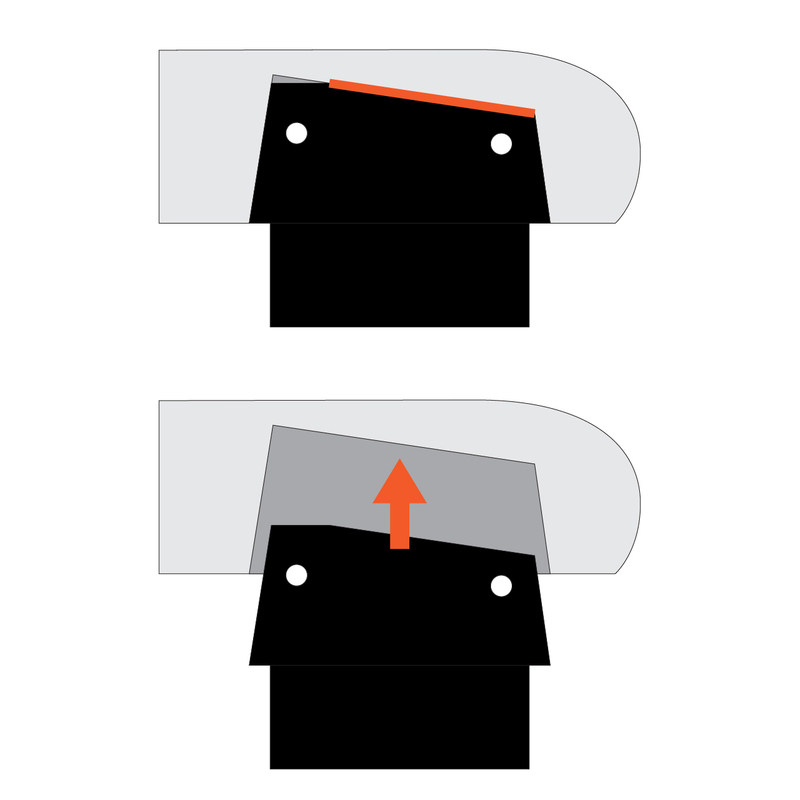 Make sure it is touching as illustrated below because all the vertical load from the foil needs to connect to the bottom of your Deep Tuttle or Foil Box, the strongest part that is designed to carry the vertical load from the foil. The top of the foil head touches the bottom of the Foil Box in the board. The top of the foil head touches the bottom of the Deep Tuttle Box in the board.